I understand that I haven't used this blog for well over a year, however lately I've felt a creative surge wash over me. During such occurrences, I feel that it's good to act on this feeling and create some cool stuff, rather than let it pass by. Therefore, I'm going to do my best to release five consecutive horror reviews in celebration of this year's Halloween. Tonight's Creature presentation will be Nosferatu, the infamous silent film that's known for it's german expressionism as well as being one of the greatest horror movies of all time. But is it really? I mean, no doubt it's a great film. Made in 1922, this film set the stage for future horror movies. By using the technique of german expressionism, director F.W. Murnau utilized a small budget to create a dreamlike atmosphere that was unlike any other film at the time. Being the first vampire movie ever made, it brought a lot of interesting ideas into vampire lore, including the theme that vampires can die in sunlight. It revolutionized film, and we still see references of it today, even in outlets such as Spongebob Squarepants. However, let's take a look at how the film's story unravels and presents itself. If you've read the novel Dracula, the events are nearly similar. As a matter of fact, Murnau actually wanted to create a Dracula film, however he was unable to obtain the rights from Bram Stoker's widow. Therefore, he set about changing the vampire's name to Count Orlock, and that's basically it. Because of this, he received a hefty lawsuit and was ordered to destroy all copies of his film. Most of them, to say the least. Therefore the storyline is familiar if you've read the novel. Guy leaves home to visit creepy castle, finds an even creepier dude living there, and after discovering the owner's dark secret, races back home before the vampire can hurt the people he loves most. The film itself is well-paced. Unlike the book it's based on, we aren't subjected to reading long journal entries that are filled with so much detail that our eyes bleed. The film sets the stage for us, and we are able to enjoy the story from the comfort of our own illiteracy. It's cinematography immerses us into two different worlds: the warm, flat-angled world of Hutter (the movie equivalent of Renfield), and the dark, crooked realm of Count Orlock. One thing I must give kudos to is how the film manages to spook the viewer. For a film that doesn't have sound, it still holds up with one of the creepiest horror scenes of all time. 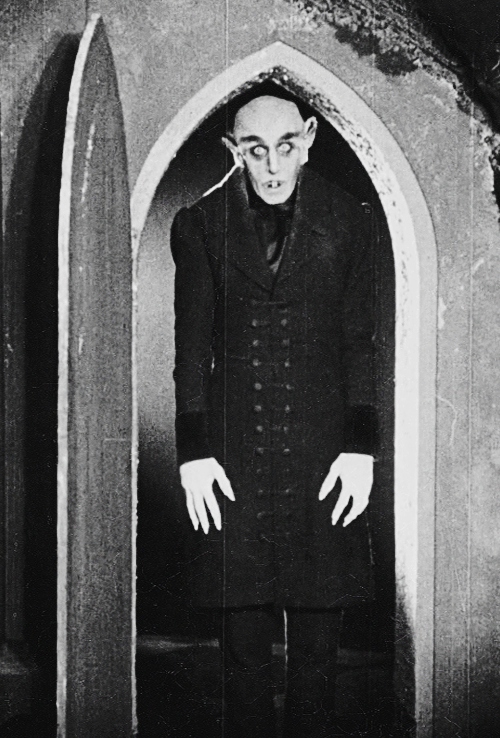 When Hutter looks down the hallway from his bedroom door in Orlock's castle, we see the vampire standing at the very end of the passageway, looking ominous as hell. As Renfield... ahem... Hutter... hides under his sheets in horror, we see Orlock at his creepiest. With his elongated arms, razor-sharp teeth, and pointed ears, he looks anything but human, which is what a vampire should look like, in my opinion. As for entertainment value, I hate to say this, but in this age of fast-paced action, jumpscares, and special effects, it's hard to be captivated by this film. The film is constructed beautifully, however because of it's slower pace and lack of action, it's hard to watch all the way through. As a matter of fact, I had to watch this film in three separate chunks, and even fell asleep while watching the second part. Watching this film is like analyzing a historical artifact, after all. If you're looking to experience a significant piece of film history, go ahead and watch it. However, if you're looking for a vampire flick that keeps your hair on end all the way through, I suggest looking for something more modern. Who knows, maybe Dracula (1931) is more in your league? Either way, the film still beats Twilight anyday. Overall, I give this film a 7/10. Although it struggles to hold up in this day of modern age films, it's techniques and visuals were so revolutionary that they set the stage for decades to come. You can't be a film buff without having watched this movie at least once. Nice! Enjoyed reading this, and although it's been a while since I've seen it, I think I agree. "Shadow of the Vampire" (2000) is another excellent one for the scary vampire lovers! Thank you! I'll definitely consider watching it.